Are you wondering what in the world the chicken-scratched sheet up at the top of this article is? It’s a picture I took to share with you of my personal declarations that began in development several years ago. 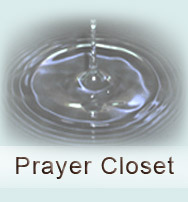 I’m going to use it to demonstrate a kind of prayer you might want to add to your own arsenal. I find this kind of prayer both effective and encouraging and most of all, it keeps me on track. Now here’s a loose paraphrase of the same thing: whatever you say will produce results in your life—real results just like food that goes from your mouth to your stomach to be digested and absorbed for the good of all your body systems. Your words have power to nourish, sustain and satisfy OR they can act like poison. Those who love life will use the power of their tongue to produce life. With that in mind I can hardly think of a better way to pray than to SAY! That’s why I decided to implement declarations from God’s Word for use in my personal daily prayer time. These declarations are not just miscellaneous scriptures; every one of them is a handpicked treasure God has given me personally over the years. If you are like me, your Bible is all marked up with them just like mine. “You are restoring health to me and healing my wounds Lord.” From Proverbs 11:25 I declare: “I will be exceedingly generous and I will be exceedingly prosperous. I water and I am watered.” A final example is from Psalm 27:13: “I will see the goodness of the Lord in the land of the living.” That passage comforted me once when I was discouraged about how long certain prayers were taking. I wondered if the answers would only come in eternity. God highlighted the verse to me as an assurance that I would see answers in my lifetime. As you consider making up a page of your own declarations, think about those things that the Lord has quickened to you. Someone else’s revelations just won’t do. What has God spoken to your heart through his Word? You probably know without too much thought the verses that are most meaningful to you. Start with those and let it grow from there. 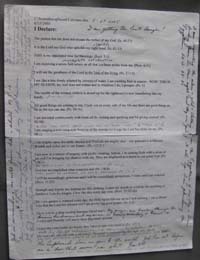 My page has grown more crowded over time with all the additional scriptures I’ve written in. Okay, what happens when we do this? Remember what I said in the beginning: what you say has power. By speaking God’s Word with declarations you agree and affirm his plans for your life. If you are using the scriptures he has already chosen for you, isn’t it a done deal like 1 John 5:14 says? When the reading of the declarations is in danger of becoming rote I switch things around a little. Sometimes (especially if I’m in a time crunch) I simply hold the sheet up to heaven as if you say, “Here it is God. Do it all!” There are also times when I stop at a particular declaration and pray over the issues that pertain to it. It’s a great reminder sheet. If you decide to make up a declaration sheet, you might wonder how long you will use it. Will the time come when the declarations will no longer be necessary? I won’t decide for you but as for me that will only happen when the Lord has accomplished ALL that concerns me!